Create Carmen Miranda’s famous look with this fruit turban headdress. This headdress features glitter fruit attached to a fabric headband. 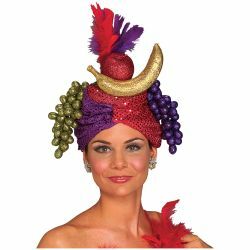 The Carmen Miranda headdress is colored as pictured and is one size fits most.